A while back when the Flint Water Crisis was near the peak of its media attention, I paid a visit to that city to put in a few hours volunteering with the Red Cross before continuing on toward Grand Rapids and other areas I would be exploring that day. But since I was in Flint I decided to take a drive around and do some sightseeing afterward. 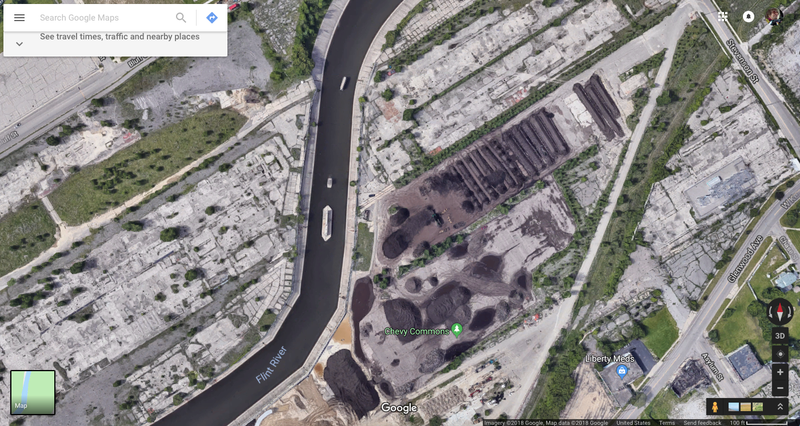 I noticed that the former brownfield where the old "Chevy-in-the-Hole" plant used to be was being turned into a park. So I decided to stop and have myself a walk along the infamous Flint River, source of all the recent water-related hubbub. After all, it was GM who is largely blamed for the polluted state of the river that everyone got sick from. If Chevrolet is the "Heartbeat of America," then the heart of Chevrolet is a barren concrete scab riddled with cancer, and its main artery is the Flint River. Ironically, GM discontinued Chevy's "Heartbeat" slogan in 1994 right around the same time as they began shutting this plant down for good. As for America, I will let the readers draw their own conclusions. Sadly I never had the chance to explore the mighty 20-building complex that once stood here along 130 acres of the Flint River, but it doesn't seem like too many Flintstones miss the place either; it was pretty much universally disliked by locals I think. The *official* name of the complex was "Chevrolet Flint Manufacturing" (later "Delphi Flint West"), but as you might've guessed almost everyone called it "Chevy-in-the-Hole" because it was a grimy polluted sh*t-hole to work at or live next to. Not quite the same thing as an ace in the hole—on the contrary it seems to have been a place of last resort. Demolished in 2004, it remained a cursed, empty brownfield for almost 20 years, and when I visited in January 2016 it was being transformed into a park. Chevy-in-the-Hole sits in the center of the Flint River watershed, which eventually drains to Saginaw Bay and Lake Huron. 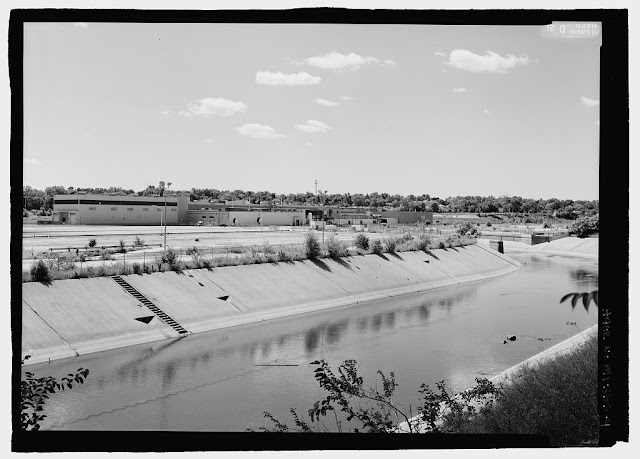 The Flint River itself was put into this concrete trench by the Army Corps of Engineers in 1963 after a few floods threatened the factory. You may recall that the Army Corps did the same thing for Ford Motor Co. on the Rouge River in Detroit...an environmentally irresponsible move that they are currently in the process of undoing. 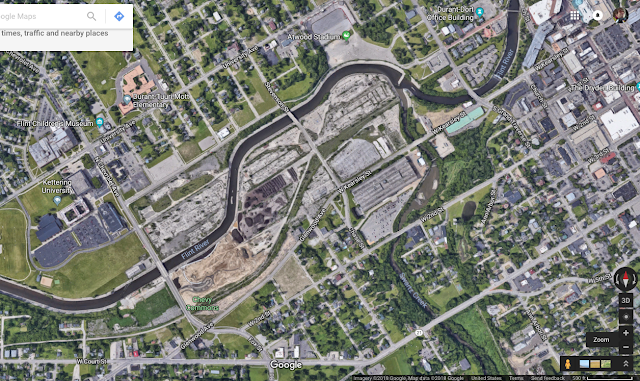 A recent Genesee County Land Bank report says that after the Chevrolet buildings were demolished, the vast empty site was paved over "to minimize movement of residual contamination, the contaminants remaining in the site’s soil and groundwater from earlier times." Yummy. When this plant began in the 1910s it was the flagship of the fledgling Chevrolet Motor Division of GM and remained so for much of the 20th century. It grew to a workforce of 8,000 people, and it played a crucial role in the great Flint Sit-Down Strike of 1937. Speaking of its role in the Flint Sit-Down Strike, author Robert Conot dramatically recounted in his book American Odyssey how key plants at Chevy-in-the-Hole helped break the month-long stalemate between GM management and the UAW men occupying Fisher Body Plant #2 and #1. The problem was that the union was strong in the Fisher Body plants, but they were weak in the Chevrolet plants. If the UAW could seize Chevrolet Plant #4 (which made engines), they could halt GM production nationwide. GM knew of this vulnerability, and as a result they had been extra vigilant to keep the union spirit from spreading into Chevy #4, so most men in that plant were scared to join. 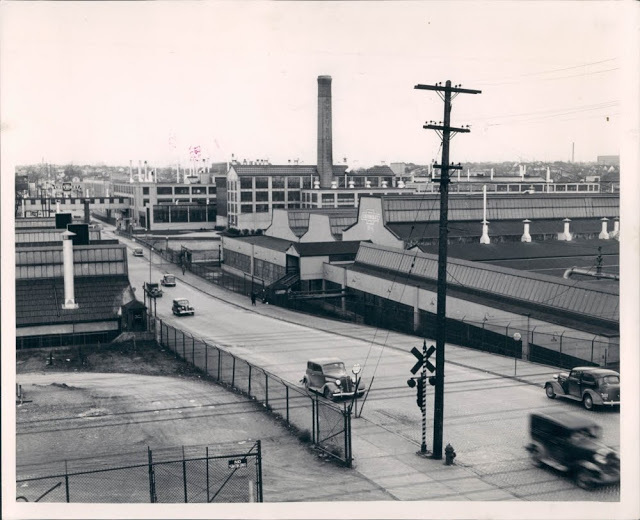 Aware that company spies were hiding in the ranks, UAW leader Roy Reuther (a brother of Walter Reuther) called a union meeting to lay out a plan for seizing Chevrolet Plant #9. 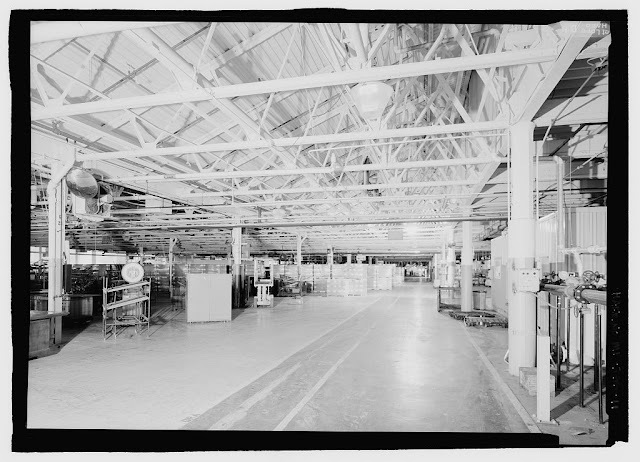 The company naturally got word that the sit-down was coming, so when the union men sounded the call to strike Plant #9, management was ready with 200 guards. 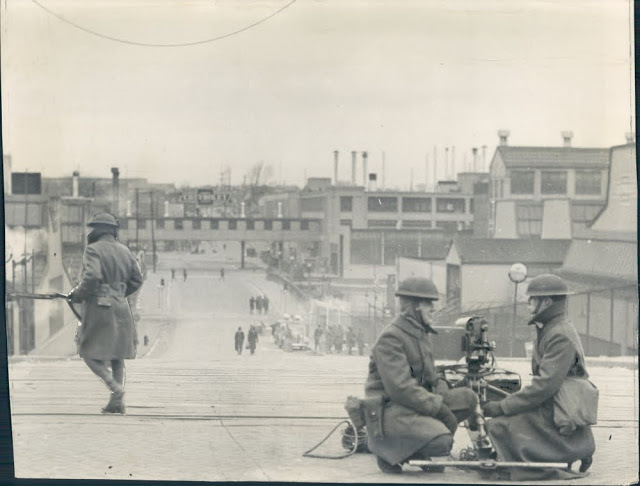 Teargas bombs were fired into the plant, and when the men began scrambling out to safety, the guards started pummeling them. The men fought back, and as the fists were flying, women sympathizers smashed the plant's windows to let the gas escape. But while this decoy battle was raging, Reuther unleashed the real assault. 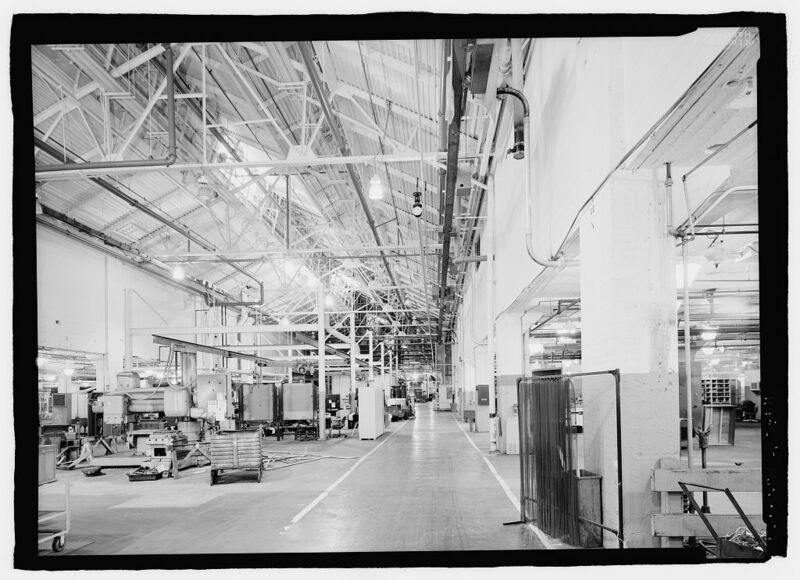 A handful of union men from the day shift had been hiding out in a bathroom at Chevrolet Plant #4, and during the chaos they emerged and tried to rally the workers to stop the assembly line. They were too few to be effective, but luckily a UAW committeeman in Plant #6 named Ed Conk was successful in rallying a massive posse there. According to Conot, Conk pulled a hidden American flag from his pocket, unfurled it and shouted "FOLLOW ME!" before leading a running charge against Plant #4. They ran about 200 yards across the complex from Plant #6, stormed their way into Plant #4 and joined the effort to rally the men there. Foremen desperately tried to quell the insurrection, but they were soon shouted down, and the machines of Plant #4 stopped. The conquerors climbed to the roofs of the captured plants with their flags and shouted "SOLIDARITY FOREVER" across to each other to signal the victories...America was shocked, General Motors' top brass was absolutely mortified, and even the liberal President Roosevelt and Governor Frank Murphy were taken aback by the brazen coup. 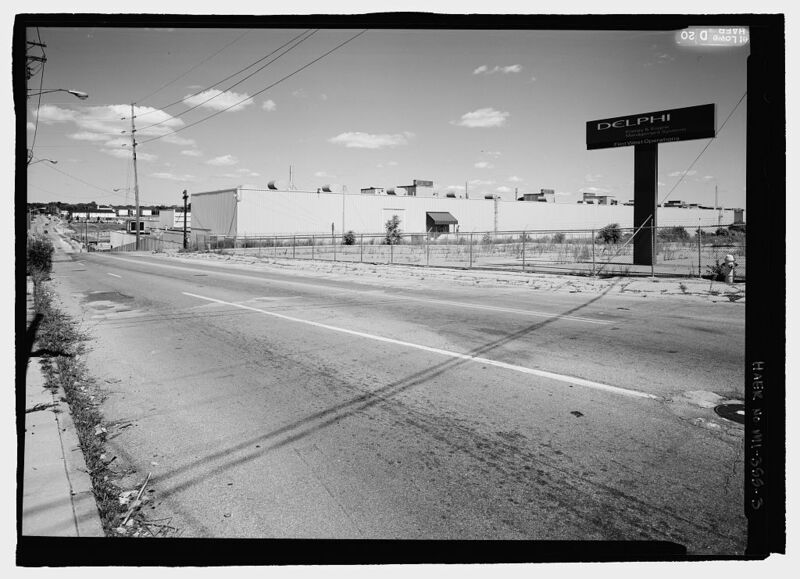 This battle was separate from the "Battle of the Running Bulls" of a month prior, where the Flint Police were pushed back across the Chevrolet Avenue bridge when the UAW seized control of Fisher Body #2 nearby. The Genesee County Sheriff threatened that the workers had 24 hours to vacate the captured plants or be removed by any force necessary. Governor Murphy already had 1,200 National Guardsmen on duty in Flint because of the Fisher Body siege, on top of the 200 local police...a bloodbath appeared imminent. Conot wrote that many feared "America's 1917 was at hand." Business leaders called it a Communist attempt to wrest control of American industry, and rumors flew through Detroit, where the Cadillac, Ternstedt Mfg, and Fleetwood Body plants were also engaged in the sit-down against GM. Almost as if the city's name was conceived as a pun, President Roosevelt recognized that if this unrest in Michigan was not resolved peacefully, "the sparks of Flint" would ignite a full revolt across a nationwide tinderbox of worker discontent. He and Governor Murphy worked swiftly to defuse the situation and prevent bloodshed. The Michigan National Guard had Fisher Body #2 surrounded, and held fast. When the sheriff's deadline to vacate the captured plants came and went, 5,000 workers marched to Fisher Body #1 and encircled it, singing Solidarity Forever. That was the tipping point...GM's president William Knudsen grudgingly agreed to negotiate with the UAW-CIO, and a peaceful wave of similar sit-down strikes rippled outward from Flint to almost every other industry in the country. The course of U.S. history was instantly changed here in February of 1937...it was the dawning of a new era for the American working class. My grandfather and I both worked at this location. I was there in 1973-1974 and he was there during the sit down strike in 1937. I never worked in Factory 2 but did work in 4, 5, 6 and 9. Believe me when I say: This was "Chevy In The Hole" in more ways than one, emphasis on the "hole." It was called the hole because of the valley it was in, but those that worked there had a little bit different meaning for "the hole." I much preferred working at Buick. 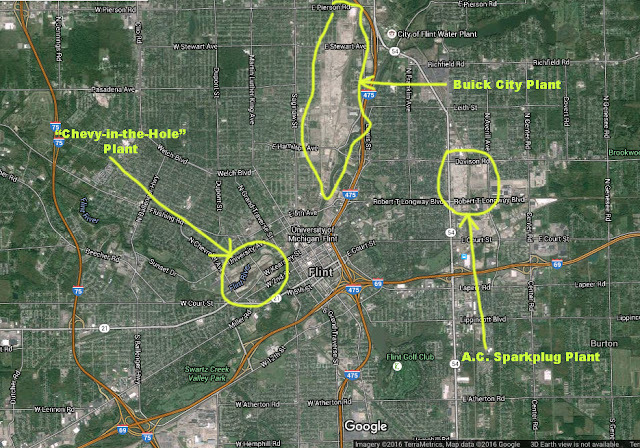 It is also important to note that the river that the plant sat on was a racial dividing line in Flint's heavily segregated neighborhoods, which I talked more about in an older post. Additionally the west side of Flint was Chevy country, the east side was AC Spark Plug territory, and the city's north side paid its allegiance to Buick. I would have to think that the workers just said they worked at Chevy until the other plant was built. All I know is when I worked there it was the dirtiest place I had ever seen. And the way workers were treated there was almost like before the union was even allowed to represent you. I could not get out of there fast enough. The stories I've written down in my unpublished memoirs would curl most other auto workers' hair. I believe it was Buick and AC Spark Plug people, along with the jealous academics who hated the people who worked there in the auto industry because they made so much money with little education, who came up with the hateful name, "Chevy In The Hole." In better days, the Buick and AC Spark Plug people called it "Happy Valley." Up until about 1970, it was the most profitable complex in the whole corporation. It also irritates me greatly that even Google Maps has it labelled "Chevy In The Hole," considering the fact that the grandfather of Lawrence Page, cofounder of Google, worked there. I worked there for short periods in the summer, and I met some of the finest people there I have ever known. Two other "near-celebrities" also allegedly worked at Chevy-in-the-Hole: Mark Farner's sister (of Grand Funk Railroad), and Casey Kasem's brother. It is also popularly believed (probably thanks to Michael Moore) that due to Flint's industrial significance during the Cold War, this neighborhood was allegedly Soviet Russia's #3-priority nuclear target in the United States. In 2005 a partnership between the Genesee County Land Bank, Sasaki Associates, Kettering University, and the C.S. Mott Foundation began forming the "Flint River District Strategy." The goal was to come up with some sort of development plan that would essentially fill in the massive gap in downtown Flint caused by the death of Chevy-in-the-Hole, as well as remediate the nasty pollution trapped under it. Their answer is to turn most of it into a park. Personally, I think parks are always a good idea...in fact since they're making it a park, The Hole probably deserves to be managed as if it were a historic "battlefield," sort of like how the National Park Service does Gettysburg or the River Raisin Battlefield. Now if only we could fix the tap water situation. BTW Have you checked out that A&A company building on 2653 Erskine st. Detroit? I have taken a few exterior photos of it, but nothing else so far. i worked there from 71-75..It was actually not a bad place to work in IMO.... My dad was a foreman there for 35 years..Kirk Gibson the baseball player worked for my dad as a summer employee..